Hastings is perhaps the most famous battle ever fought on English soil and resulted in William, Duke of Normandy, becoming King of England. Popularly known as William the Conqueror, his victory over King Harold and his forces was a pivotal turning point in English history, the influences of which are still to be seen today. Unfortunately, due to sales rights restrictions, we cannot offer Hastings 1066 for sale in your country. Hastings is perhaps the most famous battle ever fought on English soil and resulted in William, Duke of Normandy, becoming King of England. Popularly known as William the Conqueror, his victory over King Harold and his forces was a pivotal turning point in English history, the influences of which are still to be seen today. 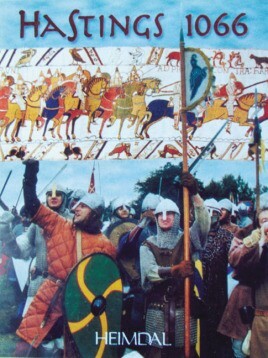 The weaponry, equipment, dress, logistics and living conditions of the soldiers from both sides are covered in great detail as is the terrain and the tactics of the two armies, using illustrations from the Bayeux Tapestry and photographs of a recent re-enactment of the battle which took place on the original battlefield.